The use of cocoa butter for skin care has a long association with African Americans and others of African descent. Belief in its moisturizing effects and other benefits have passed down through generations of people with dark complexions. Cocoa butter has several beneficial substances that might explain its historical popularity in the folklore of African American skin care. African Americans and others with dark skin tones are more prone to certain appearances and challenges of the skin than people who have lighter-colored skin. There is little or no research on the subject of the beneficial effects of cocoa butter for people of African or other dark-skin ethnic descent. Much of the trust in the substance for effects on dark skin problems comes from cultural traditional use and anecdotal testimonials. Women of African descent in America and in other countries also have a tradition of using cocoa butter to try to prevent stretch marks during pregnancy. There has been increasing use of cocoa butter for this purpose among other women of all skin tones. 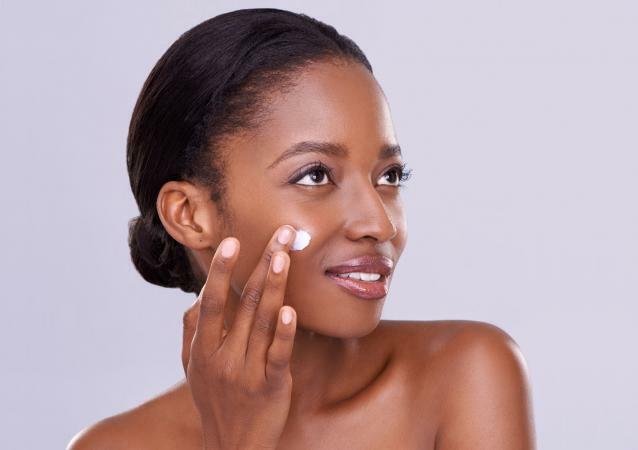 Cocoa butter can help relieve the following skin problems that can be more challenging to some African Americans and others with dark skin tones. Although it is not a magic elixir for skin health and repair, cocoa butter has great moisturizing and healing benefits. Solid at normal room temperature, it melts quickly on contact with skin so it is easy to spread and absorb for these conditions. Dry skin is not unique to African Americans but it can be more evident on dark than white skin. Dryness might appear as whitish or greyish, so-called ashy areas, caused by the accumulation of the dead surface skin cells. This will make the skin look more dull and flaky. Cocoa butter's rich moisturizing, hydrating properties can improve the appearance of dry skin on those with dark skin tones. The fatty emollients lock in moisture to keep the skin more hydrated, moisturized. and brighter in its appearance. Rough, thick, and darkened skin from pressure, especially on elbows, knees, hands and feet, is more common in people of African descent. Daily use of cocoa butter will help moisturize, smooth, and soften these areas. Regular use will also help to fade the darker skin on these areas, giving elbows and knees a more even skin tone. Hyperpigmentation (darker skin) can occur after healing of even mild skin scrapes, insect bites, rashes, infections, or other diseases. According to the Journal of Clinical and Aesthetic Dermatology, this is a more common challenge for African Americans and others of dark-colored skin. The greater tendency for dark skin discolorations is due to increased production of melanin and can worsen with sun exposure. Cocoa butter might improve uneven skin tone, especially on the face where darker spots can be more obvious. It can also protect the surface layer of skin from outside agents that can damage and darken the skin. However, while cocoa butter might help diminish the appearance of darkened areas over time, it is not a major skin lightening substance. African American skin is more prone to scarring from acne, scrapes, cuts, and incisions. The normal healing process of skin can cause thicker scars or keloids that are harder to treat. Cocoa butter's healing properties might soften and reduce the appearance of these scars and other skin blemishes. African American men have a greater chance of getting annoying, itchy razor bumps which seem to worsen with each shave. A major part of the problem is in-growth of the ends of facial hair under the skin. This can cause inflammation and infection, scarring, and hyperpigmentation of the affected skin. Cocoa can soften the skin and reduce these effects of shaving. It can be helpful to moisten the skin with cocoa butter before shaving. Many African Americans, and now other women in many countries, also use cocoa butter to try to prevent or reduce stretch marks. However, research published by the BJOG: An International Journal of Obstetrics and Gynaecology, 2008, and in the Cochrane Systematic Review of Studies, 2012, found no evidence of effectiveness. Daily use of cocoa butter, however, can help to keep dry skin on the abdomen and hips moisturized and supple. This might help to reduce tearing of skin elastin fibers and prevent stretch marks, or reduce their appearance. There is no study comparing the effect of cocoa butter on dark versus light skin. Cocoa butter is derived during the processing of the beans (seeds) of the cocoa or Theobroma cacao plant. According to a 2000 Journal of Clinical Nutrition history review, cocoa has been used for medicinal purposes for centuries, starting in Central and South America. Compounds in cocoa butter can explain its effects on skin and why African Americans have long trusted the fatty substance for its potential benefits. Research, summarized in a 2014 review in Nutrients, shows that cocoa butter is rich in several superior components and properties beneficial to skin. Healthy free fatty acids, mainly oleic, palmitic, stearic, and a small amount of linoleic acids. Triglycerides, derived from the free fatty acids, lock in moisture and soften, smooth, and help heal dryness and other sensitive conditions of dark skin. Essential minerals, including magnesium, copper, potassium, and iron that benefit skin functions are abundant in cocoa butter. There is also a small amount of vitamin E and vitamin K.
The deep moisturizing, emollient, hydrating, healing, and anti-aging effects of these cocoa butter components might be especially effective for the problematic skin conditions more common among darker skin people. It is important to note that other moisturizing compounds in skincare products, such as the fatty acid cetyl alcohol, can also have similar benefits. Because pure cocoa butter can be expensive, some products might be mixed with other oils as the primary ingredients. Read the label before buying a cocoa butter cream, lotion, soap, or other skincare product to ensure that cocoa butter is the main ingredient. 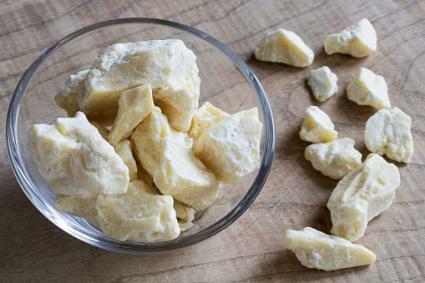 You can buy raw or pure cocoa butter, which tends be be a lighter yellow color than processed cocoa butters. Raw or pure cocoa butter also contains more of the desirable fats and polyphenol antioxidants than the processed products. 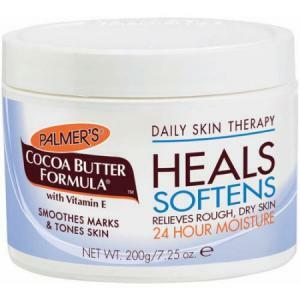 Palmer's Cocoa Butter Formula contains vitamin E in addition to cocoa butter. This cream is formulated to smooth rough skin, marks and scars and heal dry skin. Walmart sells the product for about $8 for a 7.25 ounce jar. Okay Natural Cocoa Butter also contains soybean oil and shea butter. You can use the moisturizing cream on your skin and hair. A 7-ounce jar retails for about $12 on the Okay company's website. Aura Cacia Nourishing Cocoa Butter contains 100 percent organic cocoa butter. You can blend the cream with vitamin E oil or other essential oil before use. Purchase a 4-ounce jar for about $8 at Walmart. Raw Prime and Pure Cocoa Butter costs around $14 for one-pound chunks on Amazon. You can use the 100 percent unrefined butter to make your own products such as body and hand creams, soaps, or lip balm. The association of cocoa butter with African Americans is somewhat stereotypical. While cocoa butter is great for darker skin problems, it can also be beneficial to all skin tones because of its moisturizing, softening, antioxidant, and healing properties. Whatever your skin color, if you have a challenge finding effective moisturizers, cocoa butter products might be your solution.